In her fourth art-related historical, Vreeland (Girl in Hyacinth Blue, 1999, etc.) 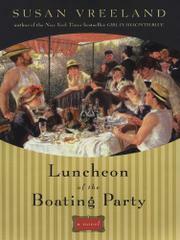 provides an in-depth look at one of Renoir’s most famous paintings (its name is her novel’s title). Vreeland’s love for Renoir is made palpable in this brilliant reconstruction.